The Marquise-Cut Amethyst and Diamond Halo Ring in 14K White Gold is a superb example of fine craftsmanship and jewelry techniques. 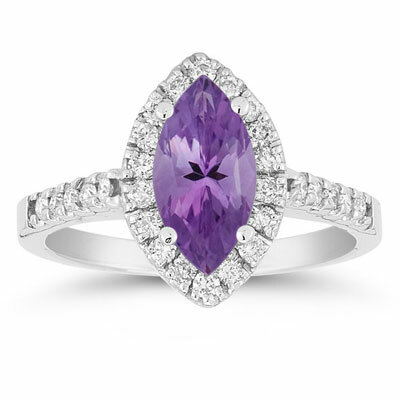 Not only does it feature a stunning amethyst marquise at its center, but it is generously adorned with a crown of diamonds around the stone that also leads down the solid gold band. This lovely ring strikes a beautiful pose on the finger, attracting the light to the 32 diamonds which reflect into the deep purple of the amethyst stone, bringing it to life. The marquise-cut amethyst, surround by a band of sparkling diamonds, measures 5mm by 10mm, and the stone's many facets decorate its surface with tiny prisms of light that span the spectrum of deep violet to pale lavender. The 14k white gold band (2mm) takes on the form of a setting as it supports diamonds on either side (0.28 t.c.w.) that bring a sparkling unison to the ring. We guarantee our Marquise Cut Amethyst and Diamond Halo Ring, 14K White Gold to be high quality, authentic jewelry, as described above.